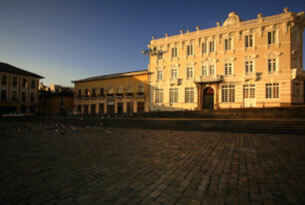 Begin this journey in one of the first cities to be given the title of UNESCO World Heritage Site – Quito, Ecuador! Here, you’ll stay at the supremely elegant Casa Gangotena Boutique Hotel, a majestic and restored mansion in which you’ll find the best combination of history and modern luxury. 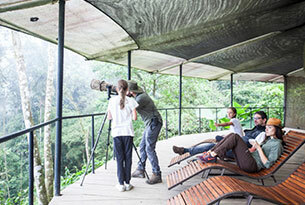 Afterward, just a few hours away, you’ll head down into the lush cloud forests that surround Quito to experience Mashpi Lodge – a National Geographic Unique Lodge of the World. This one-of-a-kind place opens its door for you to live an unbeatable experience of both nature and luxury. 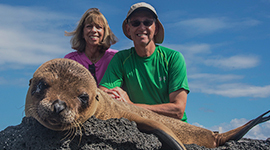 Following that, you’ll finish this journey with the magnificent, finishing touch that is the Galapagos Islands aboard the fantastic Yacht La Pinta! Welcome to Quito, Ecuador! At the airport, you will be greeted by a member of our team who will assist you with your luggage and transfer to Casa Gangotena Boutique Hotel. 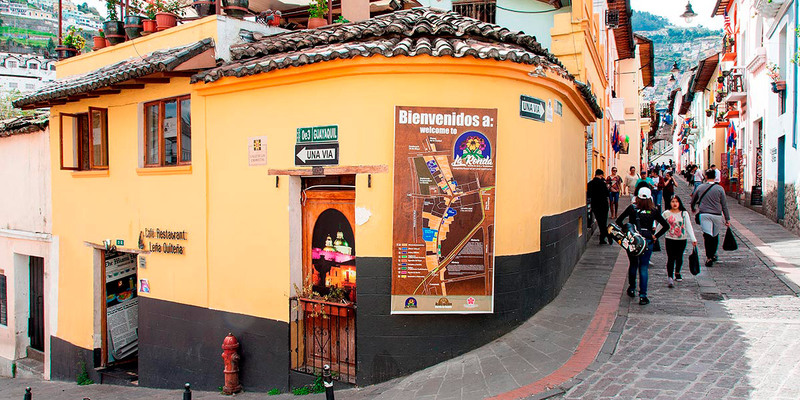 During the ride, you will receive a brief introduction of Quito and Ecuador along with valuable information regarding your stay in the country. Quito’s Historic Center – the largest and best-preserved Colonial Quarter in South America – is a UNESCO World Heritage Site. On this day, we will take stroll through the Independence Plaza, which itself is flanked by the Cathedral, the Presidential Palace, the Municipal Building and the Archbishop’s Palace. After that, we will visit the La Compañia de Jesús Church and admire its gilded interior before continuing onwards to the San Francisco Church and Convent – one of the largest architectural structures within a historic center in the Americas. Its impressive façade and atrium lead into its equally impressive Baroque interior. 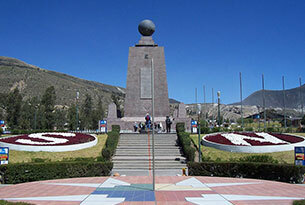 After that, we’ll visit one of Quito’s most iconic viewpoints – El Panecillo Hill! Afterward, you’ll head to the Middle of the World and get to place both feet on each side of our planet’s equator! 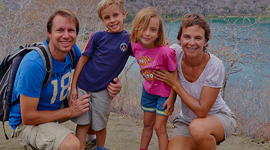 At the end of the tour you’ll be taken back to Casa Gangotena Boutique Hotel. Overnight in Quito. Rise and shine for the next part of your adventure! 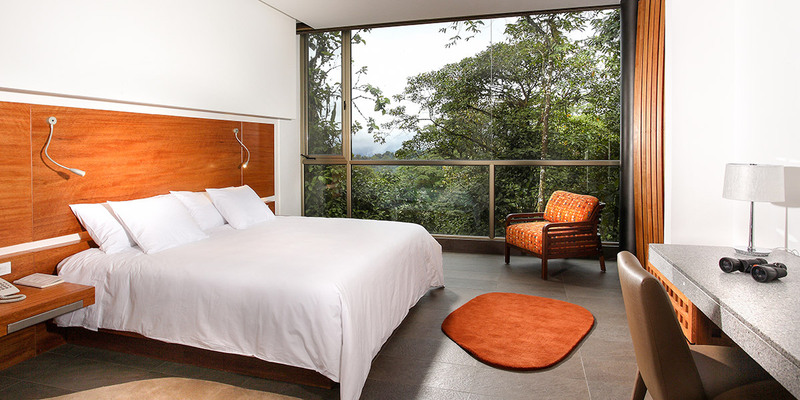 Guests will be picked up and taken to the Mashpi Reserve – a 1,300 hectare (3,200 acre) swath of cloud and rainforest that is located within the Metropolitan District of Quito. Upon arrival, Mashpi’s staff will take your luggage to your room. Shortly after that, you’ll be invited to Lunch followed by an introductory briefing regarding the Lodge. After that, it’s time to head out and explore! 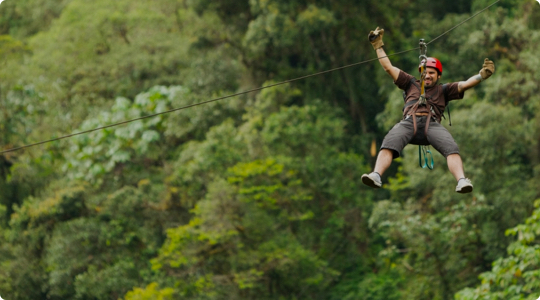 Throughout the following days at Mashpi Lodge, you will get to have a guided experience of the natural wonders of the Mashpi Reserve while staying at the spectacular, National Unique Lodge of the World that is Mashpi Lodge. The sweet songs of the birds around the Lodge in the early morning will help you start this new day with a smile! On this morning, you’ll have different options for how you wish to begin: you can either start at the crack of dawn for a hike around the surrounding forest with your guide. Alternatively, you can choose to have a relaxing morning and sleep-in for a little longer, enjoy breakfast at the restaurant and treat yourself to a relaxing massage at our Samay Wellness Center. After that, you can head out into the forest with you your guide. Following lunch, you and your guide can choose what to do throughout the remainder of the day. Open your eyes to a brand new day! In the morning, you’ll be invited to head up to the rooftop terrace, from which you’ll get to enjoy early morning snacks, hot beverages, and some incredible birdwatching. Afterward, you’ll enjoy a full and complete breakfast downstairs, be it our restaurant area or while exploring the forest outside. Throughout the remainder of the day, you’ll keep exploring and unraveling the mysteries of the Mashpi Reserve in the company of your guide! 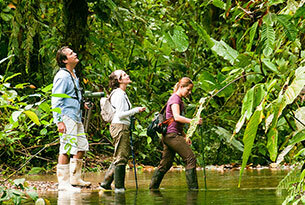 You will take a transfer to Quito’s airport in time to catch your flight to the Galapagos Islands! This adventure begins with your flight to Baltra Island followed by an immediate transfer to the nearby dock to board Yacht La Pinta. Following an onboard introductory briefing, you’ll partake in an emergency boat drill. Afterward, you’ll receive your cabin assignment and enjoy lunch. Here, the turquoise waters of the channel contrast brilliantly with the white sand beach and volcanic rocks that make up the shoreline. Along the coastline, you’ll spot sea lion colonies and seabirds frolicking along the cliffs of this small but spectacular island. 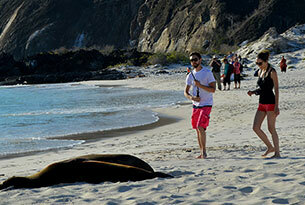 We take a dinghy from Yacht La Pinta over to this idyllic white-sand beach that’s populated with colonies of sea lions. The brilliantly yellow Santa Fe land iguana, which, in the entire world, is exclusive to just this island, might also be spotted during the walk. Later, you’ll have your choice of swimming or snorkeling along a natural wave barrier. After lunch, we disembark at Puerto Baquerizo Moreno. 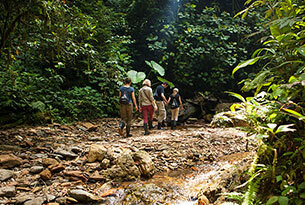 Once we arrive at Cerro Colorado, we will visit the breeding center for the highly-endangered giant tortoises that amble around a fantastic deciduous forest. In the morning, the group heads over to the eastern tip of San Cristobal Island. 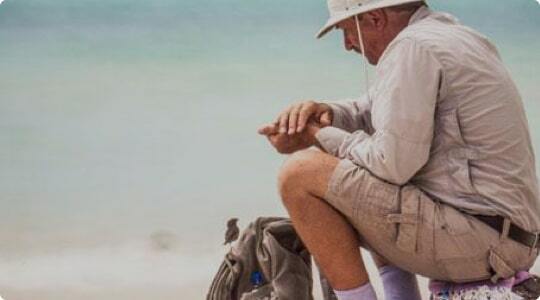 The trail that ascends from the beach provides spectacular views of the shoreline, allowing guests to observe frigatebirds and a colony of bachelor sea lions. After the walk, weather permitting, you will have the chance to swim along the beach and snorkel. After lunch, we’ll visit Cerro Brujo. 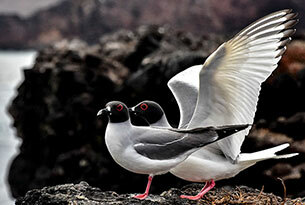 This is a great site for walking, with rewarding opportunities to observe seabirds and shorebirds. 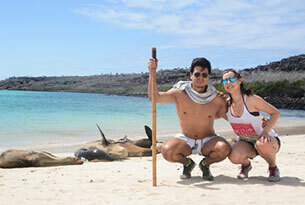 Galapagos sea lions will also be present! 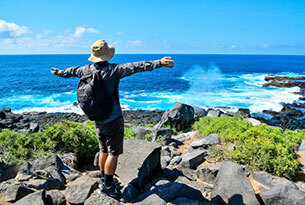 The morning outing at Punta Suarez gifts us a spirited trek across lava terrain to visit the unique seabird colonies that populate this area. Waved albatrosses (visible from April until January), and the famous “blowhole” geological formation await! Afterward, we return to the yacht for lunch. Day 10: Santa Cruz Island / Transfer to Airport / Farewell! 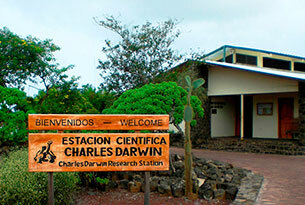 In the morning, we disembark in Puerto Ayora and visit the Charles Darwin Research Station to check out the breeding program for giant tortoises. Afterward, a bus takes the group up and over Santa Cruz Island to the opposite coast. Once on the other side of Santa Cruz Island, a short ferry ride will takes us across the channel to Baltra Island and then the airport. 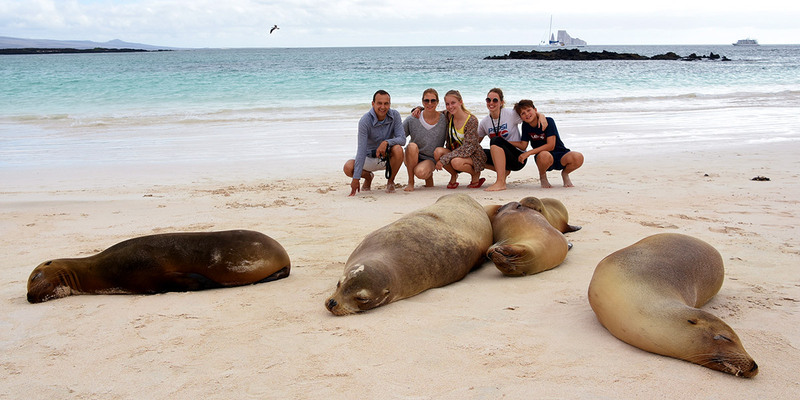 Your adventure in the Galapagos Islands ends at Baltra Island as you board your flight back to Quito. Upgrades to Yaku Suite (Mashpi Lodge) are $286 per person. I was impressed by the knowledge and safety considerations of all of the guides. […] The private reserve is stunning and the sky bike, dragonfly and various hiking trails and waterfalls allow one to enjoy it all in such a special way. 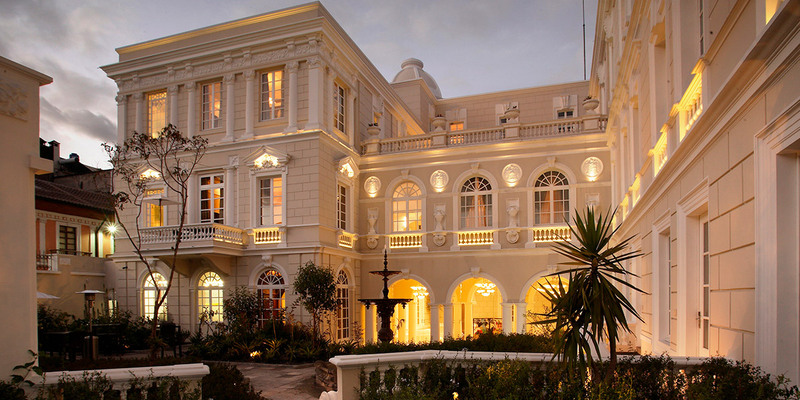 It was convenient to book my stay at Casa Gangotena in Quito in conjunction with Mashpi as it is the same tour group. The Mashpi experience is amazing and unique and has been, without a doubt, the highlight of my vacation in Ecuador. Mil gracias.